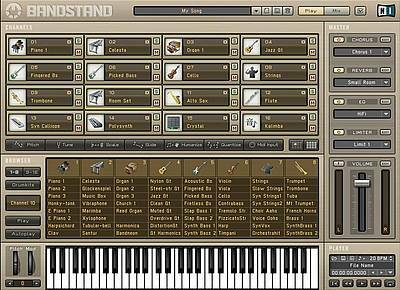 BANDSTAND is an excellent sound module with a General MIDI 1 compatible instrument library, perfect for musicians, composers and entertainers. The 128 carefully selected high-end instruments and 9 drumkits balance one another perfectly to create a smooth sonic image, ideal for playing back MIDI files. BANDSTAND sets new standards with respect to the sound quality of the library, the integrated effects, the convenience of the editing tools and its overall usability. Вы можете получить более детальную информацию о диске "BANDSTAND VSTi" на сайте производителя. На нашем сайте вы можете скачать или купить почтой BANDSTAND VSTi. Этот товар поступил в продажу в наш магазин 28 Декабрь 2005 г.